28 years, 1 month, 18 days old age. Rahul Tripathi will turn 29 on 02 March, 2020. Only 10 months, 10 days, 22 hours, 8 minutes has left for his next birthday. Rahul Tripathi has celebrated the total number of 28 birthdays till date. See the analysis by days count and bar graph. Rahul Tripathi was born on 02-03-1991 in Ranchi in the state of Jharkhand, India. He is an Indian Cricket Player. Rahul Tripathi grew up in Pune and played for Maharashtra at the first-class level. He shot to fame after his performance in the IPL 2017. After a forgettable season in 2016, Rising Supergiants were in search of a settled opening combination. He gave them a blistering start more often than not and was instrumental in his team reaching the IPL finals. After a stupendous show in IPL 2017, he was sure to draw some attention at the IPL auction table 2018. He was finally roped in by Rajasthan Royals for INR 3.4 crores. He, however, had a mediocre season as he was asked to bat in the middle order. Since the experiment didn't work out for the franchise, he might get some opportunities at the top of the order after the incumbent Jos Butler will return back for national duties. He was born to Colonel Ajay Kumar Tripathi. His father is an ex Indian Army Colonel. He has migrated to various places during his childhood as his father was in the Indian Army. BCCI felicitated him with M A Chidambaram Trophy for best U-25 cricketer in the year 2014. 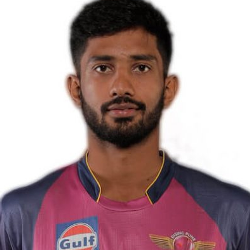 He was bought by IPl franchise Rising Pune Supergiant at his base price of INR 10 Lakhs.